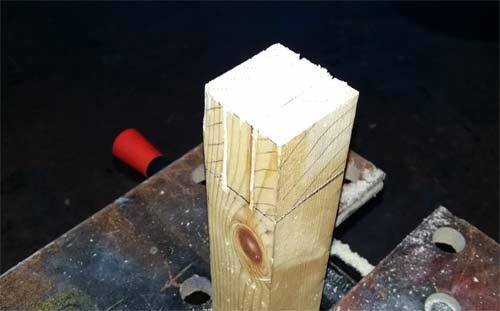 In this DIY project you will learn all about the bridle joint, one of many different joints used in woodworking and carpentry. You will learn all about the different types of this specific carpentry joint there are and when each should be used. You will also find out about the checks that you should carry out when selecting timber to use to make your joint and what tools you should use to ensure your joint is as accurate as possible. 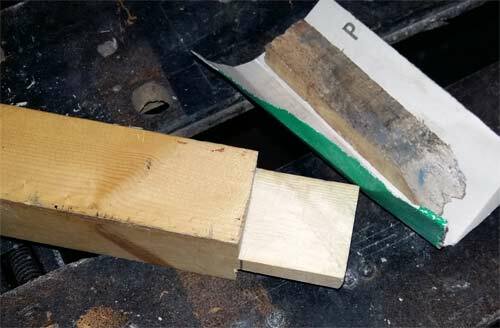 If you have seen any of our other DIY guides covering timber joints you should be well aware at this point how useful a strong and well formed woodworking joint can be and also how integral they can be to the successful completion of a project. Besides the structural strength and integrity timber joints can add, they also give a very aesthetically pleasing and authentic look to a piece of work. For example, the heavy oak beams used to form the structure of many old barns, that become the focal point of many a barn conversion wouldn’t look anywhere near as nice if they were bolted together as opposed to using the correct joints. As we have mentioned in our other timber joints projects covering timber halving joints and also mortice and tenon joints etc…. it is hugely important that you use the correct type in the correct situation, for example, a corner halving joint may be fine for building a set of shelves, but might not be the best choice for a heavy piece of furniture that’s going to get a lot of use. 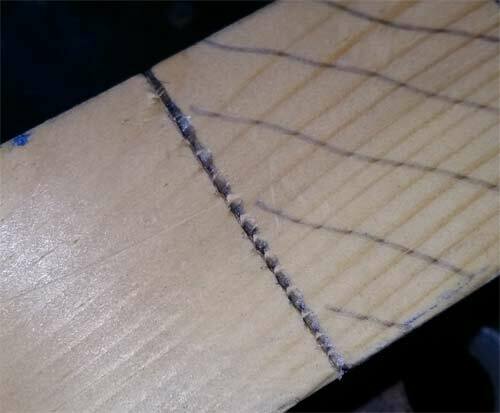 For this DIY project, we are going to look at the bridle joint. 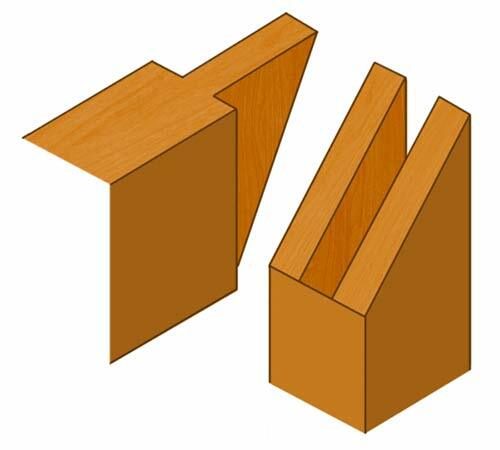 This type is essentially very similar to the mortise and tenon joint, but the main difference between them is the length of the “mortise” and the depth of the “tenon”. 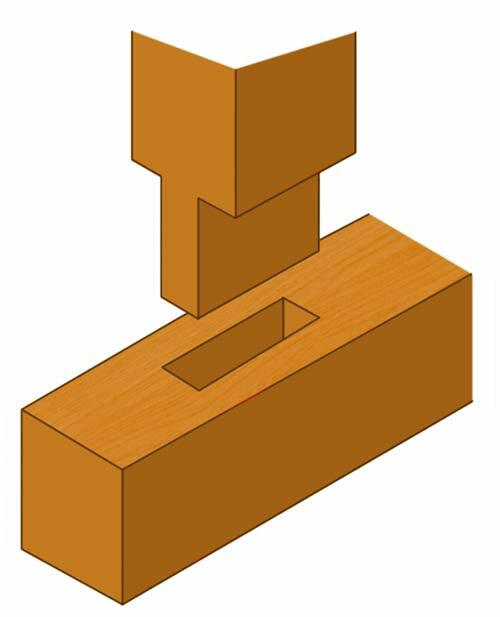 With the bridle joint, the mortise runs the full depth of the tenon meaning that the grains of the actual tenon can be seen at its end, whereas with a traditional mortice and tenon this is not so. This does have some advantages in the fact that the longer and deeper sections allow for a greater fixing area which technically makes the joint slightly stronger. On the other hand, this also has a downside in that the grains are visible to all. This might not be a major problem to you but if it is, the traditional mortise and tenon may be a better choice as any end grains are hidden. This generally looks much more visually appealing. One of the main uses for the bridle joint (or “T-bridle” as they are also called) is for joining uprights such as legs etc…. to benches, tables and other similar objects where you don’t want to affect the structural integrity of existing rails or horizontal beams. 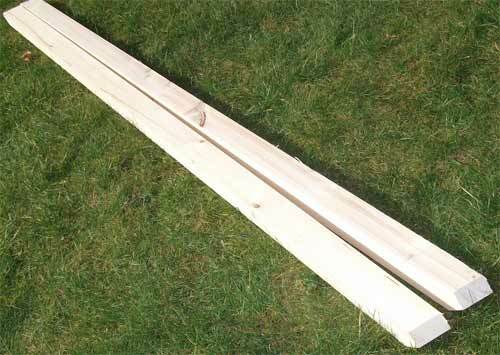 Using a bench as an example, you could cut the top rail in half and use mortise and tenon joints to join the rails to an upright to use as a leg, but this would weaken the top rail. By joining the leg using a bridle would retain the strength in the top rail. Condition: The visual appearance of finished project is in most cases, very important so you are going to want to choose your wood so that it will help towards this goal. With this in mind, look out for splits, planing imperfections, excess sap etc…. What Tools do I Need for Making a Bridle Joint? As with most woodworking jobs, their success does in some way (but not always) rest on the timber you are using, your level of skill you have and also the tools you are using. If you are going to be using a screwdriver as a chisel, a jack saw instead of a tenon saw or mole grips instead of a G-clamp, this will obviously have an impact on how good your joints, fittings, cuts etc… are going to be. With this in mind you should try and get hold of or purchase the best tools that you can find or afford. Cheap tools are fine to use, but make sure they are sharp and straight, or at the very least, the right tools for the job. As there are several types of bridle joint, for the purposes of this project we are going to show you how to make a corner bridle. The first task is to check the timber you’re going to use and decide which faces are going to be pointing where e.g. visible once fitted. If there are any knots or slight imperfections and they can be hidden it’s a good idea to do this. The next job is to square up any ends you will be working with. Don’t rely on the fact that they have been cut square in the shop or factory as in most cases they won’t have been. Measure and mark a line all around the outside of each piece of timber, over each face around 4-5mm from the end and then cut this off. Ensure that you cut this off 100% square so that you can be sure you have a totally square edge. Ideally, use a mitre saw, bench or table saw or something similar as you can then be sure that all is square and true. If you don’t have one, use a hand saw by all means, just check and ensure all is straight and true. So that you know exactly what and where you need to cut you are now going to mark all of our cutting lines. To get your marks accurate, measure down with a tape or ruler, make your marks and then joint them up with a square. Firstly, measure and mark the depth of the piece of timber you are going to use as your mortise section on the piece you will be using for the tenon. The tenon will run the full width of the mortise so this measurement needs to be precise as you don’t want it poking out of the end. 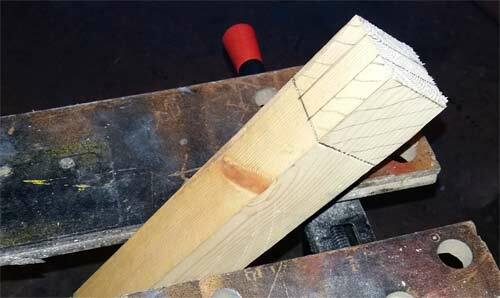 With your line marked all the way around, now measure the width of the tenon timber and divide it by three. 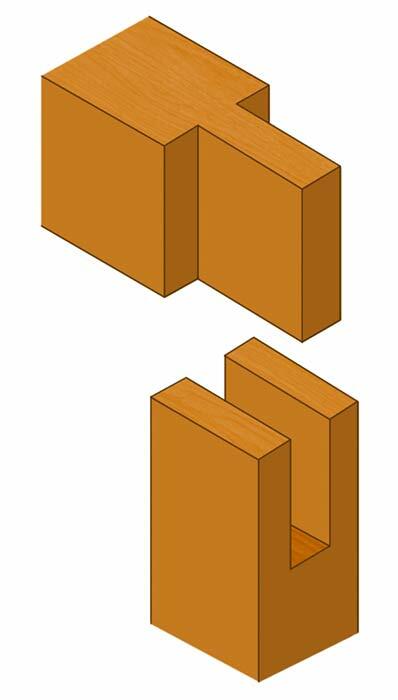 The tenon itself needs to be a third of the width of total width of the timber. Accurately mark points at a third and two thirds of the width on the end edge and also along the line that you marked that signifies the width of the mortise timber and then joint the two parallel marks together to form the tenon. If you have one, the best tool to use here is a mortise gauge. 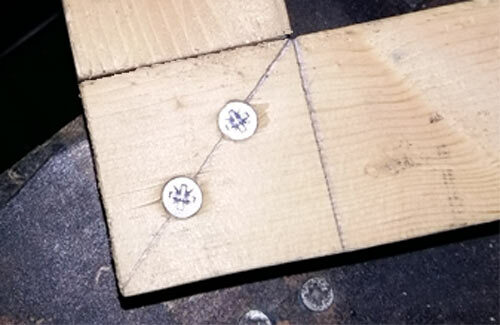 If you do have one, but are unsure on how to use it, there is a handy guide on using mortise gauges here, but for the sake of this demo we are going to use a a pencil, ruler and square. 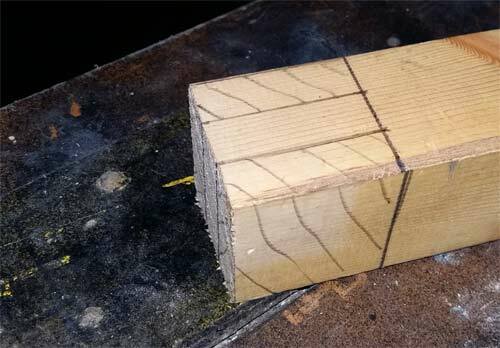 Flip the timber over 180° and repeat the above on the opposite side to the one you have just marked. Once done, you should now be able to see the two waste sections you will need to chop away. So that this is easily identified, shade the scrap sections in so that it is easy to see what has to be removed. 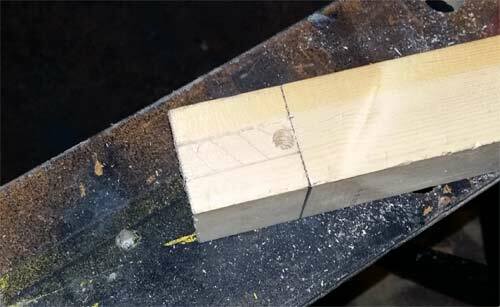 To mark the cutting lines for your mortise uses the exact same steps as above, only instead of cutting away the two end pieces to leave the middle section, this time you will cut out the middle and leave the two ends. Before you start cutting it is a very good idea to score over any cut lines that run across the grain with a marking knife. By doing this you should then avoid too much breakout at the ends and it should also be easier to start with a straight cut from the off. It doesn’t matter too much which section you start with, so feel free to pick one, but for this demo we are going to start with the tenon. 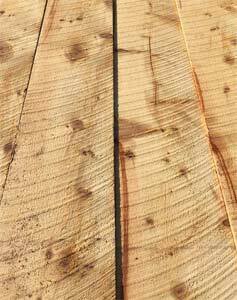 Using a vice or Workmate, position your timber and grip it tightly, angling it to about 45°. Position your saw at the point on the top and start cutting downwards. Cutting at an angle will not only allow you to easily see the line defining the shoulder that you need to cut too, but will also allow you to stay nice and straight. Make sure that you are cutting in the right place e.g. if your line is marked on the exact point that you measured to, you will need to cut outside or inside the line to retain the precise size of your joint. This goes for both sections. With your first cut made, turn the timber round and repeat the above on the second cut. Finally, level the timber up and then cut downwards and through the “triangluar ” area that is now left in the middle. Once done you should now be able to remove the first waste section. 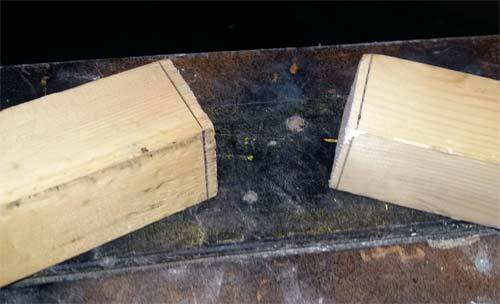 Now you can repeat the above for any other cuts you need to make to finish off the tenon. Drill a Hole: This is probably the easiest and best way – using a suitably sized drill bit (as close to the width of the joint as possible, but not over it) drill down through the waste section so that you can then cut down to the hole. Once cut and the waste removed you can then tidy it up using a chisel. NOTE: Drill your hole before you make you cuts! You should now be looking at what resembles a bridle joint so position the two sections together to see how good the fit is. 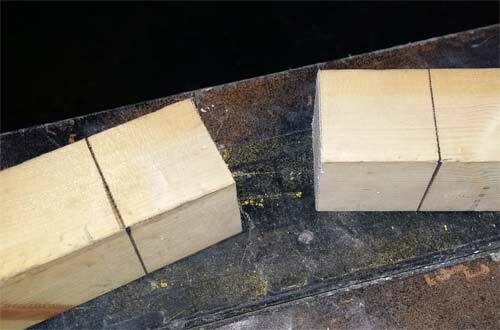 If all cuts and chiseling are dead straight and accurate then the joint itself should be tight but moveable, but if you have to force them together you will need to do a little adjustment. If you are lucky enough to have a nice tight (but not too tight) fit then before we actually fix the joint together it’s a good idea just to run over any cut faces with a fine grade (240 grit or more) sandpaper. Using a sanding block or flat piece of scrap timber, wrap the paper around and then gently run it over all surfaces, stopping frequently to test your fit and ensure that you have not taken too much off. If the joints are so tight you can’t actually fit them together then we are going to need to take off some material. Preferably, this will be done using a very sharp chisel, but if you don’t have one, use a course grit paper such as 80. To find the binding points, gently push each section together until they stick and make a mark. Also, check over each cut face to make sure it is flat and level. If you can visually see that an area is not then this is a good starting point. Additionally, if you can see from any cutting marks that remain that a cut has gone slightly off, then this is also a good sign of where to start. It is a very tricky job to make accurate adjustments to a fit, so as you sand or remove material, check the fit regularly to make sure that you are not taking off too much, which will then render your joint loose and sloppy. Once you have chosen your fixing and your bridle joint is now complete, pat yourself on the back and go and make a nice cup of tea, job done! If you would like to know about all the other different types of timber joints, check out our other projects below.